You know what a Knit-Along (KAL) is, correct? For those non-knitters out there, a KAL is a group of knitters who knit a specific pattern together. The KAL can be physically together or it can take place on the Internet. My recent Yoga swap partner, velostricken/Larissa wrote the definitive book on KALs, Knitalong: Celebrating the Tradition of Knitting Together. I'm taking part in a fun Knit-Along on Plurk. Don't know Plurk? It's a new fun social networking site -- I like it better than Twitter. My friend Tamsie (otherwise know as my spoiler, Ruby Colorway) invited me to take part. We're beginning tomorrow night. The pattern in the Todos Scarf from The Unique Sheep. 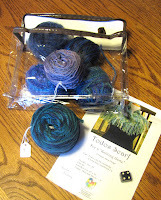 My yarn collection from them is in their "shadow dance" colorway -- a lovely mixture of blue, violet, and turquoise.